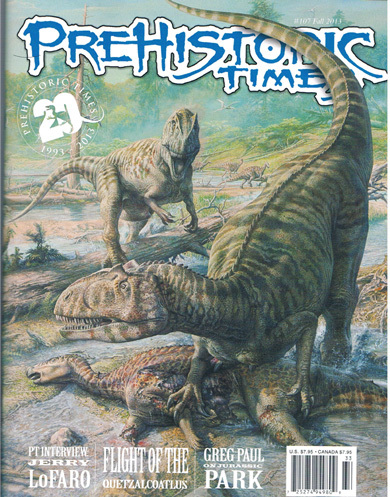 Issue 107 (autumn 2013), of the magazine for dinosaur fans and model collectors – Prehistoric Times is due out in the next couple of weeks or so. Team members at Everything Dinosaur are already swishing their dinosaur tails in anticipation. This quarterly magazine is going to showcase the artwork of collectors and fans of dinosaurs and other prehistoric animals. Creatures featured in this edition will be the formidable Utahraptor and the mighty Uintatherium. There will also be updates on Jurassic Park, tips on model making, plus a summary of the latest fossil finds and discoveries. Look out for a review published by team members at Everything Dinosaur when the magazine arrives.